Engrave this item for $10. This is a beautifully handcrafted dagger featuring a slim 10-1/2 inch high carbon steel blade. Both the cross guard and pommel are nickel plated and are created in a uniquely decorative design. 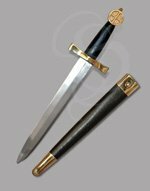 The leather grip has an ornamental contoured shape that adds a further measure of style to this beautiful dagger. 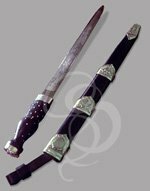 The dagger includes a wooden scabbard wrapped in black leather. 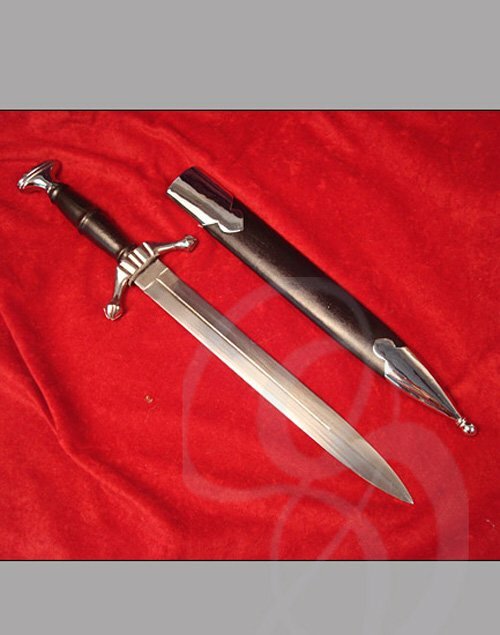 This sleek stylish dagger is a great choice for either a man or woman. 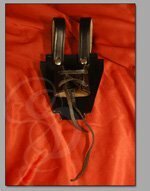 Perfect hide out knife for the unsavory knight,sharpened,makes a good utensil in the mead hall.